GEM has reported a couple of times this summer how Eva Moskowitz (on Klein’s left) has been elbowing one of her Harlem Success Academies deeper into P.S. 123 space all summer. Teachers and parents from 123 mounted their first protest on July 7th after hearing reports that their classrooms were being packed up by HSA movers (non-union, we heard) without warning. Apparently even the school’s principal, Beverly Lewis, was not kept in that loop. Angel Gonzalez made a video of the event. Gem began receiving calls on Thursday evening from PS 123 parents and teachers that the DOE had ruled in favor of Eva Moskowitz and the movers and painters were coming Friday morning. They asked us to be there and we were. That all press reports ignored our strong presence is not surprising. Of course, no one believed him, and of course P.S. 123 never got a coat of new paint. A perfect example of Haves and Have Nots — and how insensitive, no: ruthless the DoE can be when it forces little kids to face disparities in the same building. In another post describing a third demonstration at the school (on July 20th), we reported on the clarity of the speakers’ message. Quality education should be for all children, not just some of them. Teachers and parents are making good on his word. They’re mounting a fourth protest at the school next week and inviting anyone who can make it to come and support the P.S. 123 community. 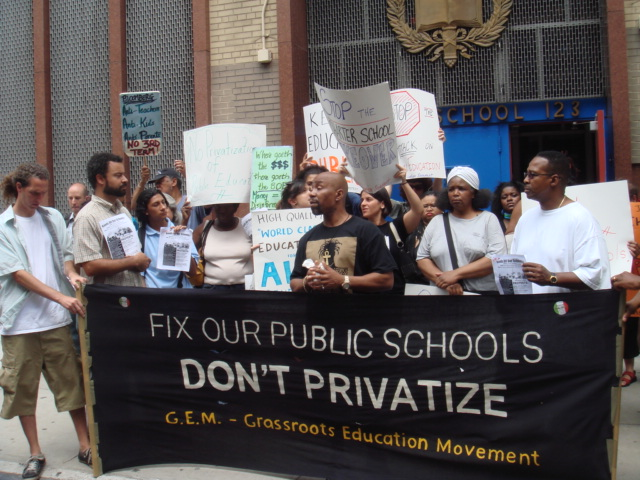 Stop the Charter School INVASION of our Public Schools! Eva “Evil” Moskowitz and her charter school must go! and community of P.S. 123! 6:30 am, In the Morning! They LIED. You were right. They lied about leaving in two years. They're not ever gonna leave. They're gonna push out 160 students and take over. Their classrooms were also painted and their entire section refurbished!!! Please tell the parents. The truth is out. We need you to come back to our school and fight with us against privatization and pushing our children out of their own schools.